Good Friday is April 19th and the beginning of Easter Break, classes won’t resume until April 29th. March was a busy month. We had conferences, the start of fall registration, the Librarian’s visit, music with Pastor Scott (the student’s voices were so loud we could hear them in the office), Men’s night and PE with Mrs. Bleifield. April will be an exciting time. After being indoors for a long time, students will finally get to feel the fresh air. The warm spring weather gives everyone a renewal of energy. Please check your child’s extra change of clothes so you can switch out the winter items for clothes more suited for spring. Registration is moving right along. The Mon/Wed/Fri classes are in demand as usual. Our registration is on a first come basis that is why it is important you get your fall registration forms in as soon as possible. If the enrollment in any one class meets it maximum, the state will not allow us to exceed that number. We are offering the 4 and 5-day program again this fall. The classes must get a minimum of 12 students for it to be cost effective. Spring photos are scheduled for Wednesday, May 1st and Thursday, May 2nd. The Pre-K students that are going on to kindergarten will be taking their individual photos in cap and gown. This is to mark the end of their time at Spin-Kemp. If you also want them in a spring pose, the photographer can offer you that option as well. The younger students will naturally be getting spring pictures. As usual there will be group photos for each class. We know many of you have younger children and sometimes families like photos of them together. If you plan on having photos taken of your younger child, he or she will also need a form with their information, please let the teacher know you need an extra form. Spring is finally here and we are ready to enjoy the warm weather and the beautiful sunshine! As the weather continues to improve, we plan on spending play time outside. Please dress your child for the temperature changes. We hope all the dads enjoyed their special evening at school. The students love to show off what they do at pre-school. This special night means so much to them. In the month of April, we will be concentrating on number concepts, rhyming words, and learning his or her address. Our Easter egg hunts and parties will be on Wednesday, April 17th and/or Thursday, April 18th. Please check the bulletin board for party volunteer sign-ups. April showers bring…God’s new wonders! We will be celebrating spring, new life and Easter. The projects will reflect the season, so check those bags for all the fun tasks your kids are doing. Easter break will start Friday, April 19th and go through Friday, April 26th. and resume Monday, April 29th. The classroom party and egg hunt will be on Wednesday, April 17th. Check the bulletin board for a sign-up sheet. As the weather continues to improve we plan on spending playtime outside. Please dress your child for the temperature changes. Also please check on your child’s change of clothes in their bag, as they may need to be changed out according to the warmer season. V, W, and X. We will be busy this month with Easter projects, an Easter Egg Hunt, Easter party, the Librarian, music with Pastor Scott and P.E. with Mrs. Bleifield. Scholastic Book Orders are due Friday, April 5th. They make great gifts for those Easter Baskets your children will be receiving this year. Letting them help you choose what book you purchase is a good way to encourage them to get in involved in reading. I realize it is economical to go to the Library but there is just a feeling of ownership in a book you really like and don’t have to return. Looking Ahead ….. Each year we do a Christian Service fundraiser as a Trike-a-Thon. The students bring their bikes or trikes and helmets to ride a course set up in the parking lot. The preschool chooses a non-profit charity and families collect money donations (from friends, grandparents and aunt & uncles) for the event. Last year we divided the money evenly between The Ronald McDonald House of Dayton and SISCA (a no kill animal shelter) in Kettering. We have chosen these same foundations this year. The Trike-a-Thon will be Friday, May 3rd. If it rains the event will be rescheduled for Wednesday, May 8th. PLEASE DO NOT BUY A NEW BIKE FOR THIS EVENT I cannot stress THIS strong enough. STUDENTS HAVE A LOT TO LEARN ABOUT NEW BIKES AND THIS IS NOT THE COURSE TO WORK OUT THESE KINKS. THEY HAVE TO BE FAMILIAR WITH WHAT THEY ARE RIDING AND ON HALF OF THE PARKING LOT THEY CAN PICK-UP SOME SPEED. THIS IS WHERE THEY CAN LOOSE THEIR FOOTING ON THE PEDDLES AND RUN OFF COURSE IF THEY DON’T HAVE GOOD CONTROL. HELEMETS ARE REQUIRED TO PARTICIPATE! WE ALWAYS TRY AND HAVE THE WRIGHT PATT'S BIKE PATROL COME AND SPEAK TO THE STUDENTS ABOUT SAFETY AND ADJUST THE STUDENTS HELMENT SO THEY FIT PROPERLY. Isn’t it exciting that spring is just around the corner? Maybe it means the end of snowy weather and we won’t have to deal with anymore school closings or delays. I am so tired of having Snow Days. I know that may sound strange but we have so much to do at school and time is growing short on accomplishing this. It’s difficult to believe we are looking at our last three months of school. I have so many mixed feelings about this time of year. It always pulls at my heart to see our Pre-K students go off kindergarten. When I was at Saint Rita Elementary School and C C Center, I got to see my former students as they transitioned from year to year and class to class here it seems so final. I guess I’m just an old softie. Enroll !. Registration for 2019/20 will begin Monday, March 4th. If your child is coming back this fall, there isn’t any need to fill out a new registration form just a continuation sheet. Continuation sheets and registration packets can be obtained from the Teachers or in the office. Please remember to include the $40.00 fee to secure that spot even if it’s a continuation form. Please don’t wait too late to make this decision. I’ve been answering phone calls and emails from parents interested in registering for the fall term. I started getting calls for tours right after we came back from Christmas Break. An unusual number of pre-registration forms have been mailed out to military families moving to Dayton this summer. If a class reaches the number of students allowed by state licensing, I cannot make any exceptions for alumni. If your child is off to kindergarten, make sure you contact your school district and begin the screening process and registration ASAP. Most districts begin screening and registrations very early. The physical components are: eye-hand coordination- is just what it sounds like the relationship to what the eyes see, the hands do and how the brain relates to the information, Gross Motor Skills-this enhances the hands large muscles movements by picking up large pieces. This leads into Fine Motor skills- with the precise finger movements by putting the pieces in the correct spot which are leading to better handwriting skills. The cognitive components are: understanding the world around- it allows children to understand their environment by manipulating the objects in their world. Shape recognition- the earliest puzzles are simple shapes (circles, squares, rectangles and triangles) with time they become more complex shapes and eventually lead into the abstract jigsaw pieces we are familiar with. Memory-children have to remember the shape of pieces, Problem Solving- this promotes and refines critical thinking because pieces will only fit a certain way and you must develop this in order to complete the puzzle or other challenging skills. The last basic skill is Emotional: this develops setting goals- the three components in this area are solving the puzzle, strategies that will be necessary to solve the puzzle such as separating familiar shapes and colors into groups for future use and patience- you development patience and how to work slowly to finish your task. Social- they learns to share by taking turns, handling frustration, helping others and sharing in the accomplishment with others. Self-Esteem- this is satisfaction of achieving a goal, learning to overcome a challenge, the pride and self-confidence in completing a task which prepares for more complex challenges in life. Early childhood is probably one of the most studied areas in education to help explain how and what children learn through play. This information came from articles on the internet by Michelle Manno and childrensmuseumblog on puzzle learning. You can find articles on just about any early childhood learning activity if you search the web. Men’s Night is a time for your child to bring Daddy, Grandpa, or a special person to school to share in the preschool experience. We always have a wonderful evening the Teachers choose crafts that are more father friendly. We hope you will make every effort to attend. We would like for every students to come and bring someone. If Dad is overseas on TDY, Moms are always welcome to come or send a friend. We are here if you should have any questions about the event, give us a call. THERE WILL BE NO MORNING CLASSES ON MARCH 18th. Believe it or not, March is here and that means spring is just around the corner! We will be celebrating St. Patrick’s Day with a week of art projects. Be sure to wear something green on Thursday, March 14th and Friday, March 15th. We will continue to have fun with learning more letters, numbers, patterning, and sequencing a story. We encourage you to spend some extra time working on letters and numbers especially if needed. This will benefit greatly for kindergarten next year. Please mark your calendar for Men’s Night on Monday, March 18th at 6:30 p.m. There will be no morning preschool that day. March promises to be tons of fun with shamrocks and a leprechaun search. You must keep your eyes open to find the leprechaun. Friday, March 15th don’t forget to wear green! Mark your calendar for Monday, March 18th for Men’s Night from 6:30 – 8 p.m. Dads you are going to have a great time at school. There will not be morning classes on that day. In class we will be celebrating March 20th, the first day of spring, with a blooming good time. We want you to know we appreciate all you do for our class and our students. This month we will be going over the letters S, T, and U, the color green and the number 7. We will also have Men’s Night Monday, March 18th from 6:30 – 8 p.m. There will not be a morning class that day. Mrs. Bleifield’s P. E. class for the whole school on March 29th. Don’t forget to register early if you intend for your child to attend Spin-Kemp this fall. Mrs. Lynch is receiving lots of phone calls, emails and giving tours to parents who are interested in sending their children this fall. This is going out early so you have time to read and be prepared for Monday, January 7, our first day back for students. Please remember when buying school snacks for the new year we do have some classes that have students with peanut allergies. We want to keep them safe so avoid sending your child’s snacks with peanut ingredients. Everyone can recharge and be ready to get back to school. Each day is exciting for us with young children. We marvel at how they are growing and happy to share in their discovery of new experiences and accomplishments. They grow so fast and learn so much in these young years. Even though your tuition envelopes will be going out before we leave for Christmas break, tuition won’t be due until we return. You may turn them in on January 7th or January 8th whichever day is your first day back from the break. I want to take some time to explain a little of what students are learning while they are here. This month let’s start with scissor skills. Did you know while students are working on cutting they are accomplishing these tasks? They are building handwriting muscles - cutting allows a child to build up the tiny muscles in the palm of their hand with the continuous opening and closing of the hand, improves bilateral coordination - this means that cutting uses both sides of the body at the same time while each hand is performing a different task (one hand is cutting the other is moving the paper), improves spatial reasoning – once kids cut out their pieces, they generally have to assemble them into some sort of craft project, improves eye-hand coordination – in order to use scissors effectively, children have to use their vision, process what is seen, and move their hands to accomplish a task, introduces concept of the tripod fingers – cutting requires a child to use their thumb, forefinger and middle finger together, the same team of fingers are required to properly hold a pencil for good handwriting, and builds confidence – working with scissors is a kill that improves quickly with practice, the more children are asked to cut with scissors, the better they get. Watch as kids feel and see improvement in this area within a short time = major confidence booster! Now, you can appreciate how important the skill of cutting is to young learners. for Middlers if you’re interested. We are looking forward to welcoming everyone back in 2019. We might be getting another student in January her name is Abby and her brother went here for two years. We will continue with our colors, this month it is white, our number will be 5 and our letters will be M, N, and O. Remember if we have a few days off due to weather conditions we will just continue on and do a little catch up. Welcome back and happy New Year! A new year means new beginnings. We will be working on the letters L, M, & N and crafts to go along with them. We will also be incorporating the winter season. Please remember to dress the students in winter gear; hats, gloves, snow boots with the ability to change into tennis shoes if they need too. Also please change their spare clothes in their bags to winter clothes if you haven’t already done so. With the winter season here and a possibility of snow, pay close attention to school delays and cancellations on channels WDTN (2) and WHIO (7). If road conditions are dangerous and the school districts find it necessary to delay or close school, we will follow their lead. 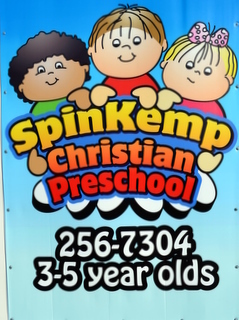 Watch for our posting Spin-Kemp Christian Preschool in the child care center and business section. Looking forward to the new year and all the great things winter brings! Holiday. We hope you enjoy your Christmas Season with family and friends. We are looking forward to the second half of our school year. As the second semester begins, keep encouraging your child to do their best. Most students have earned their birthday sticker on the skill charts. We will now begin to focus on learning their phone numbers. Please work on this skill with your child at home. This month we will be working on recognizing our last name, starting the teen family of numbers, letters, and patterns. There will not be any school on Monday, January 21st in honor of Martin Luther King Day. Our time will fly as it did in the first semester so hold on tight and enjoy the learning.